This paper describes the implementation of a circulating current scheme that uses IEC 61850 GOOSE messages to provide automatic voltage regulation for up to four paralleled power transformers. IEC 61850 need not be applied on a substation-wide basis. There are many power system operation and control challenges that can be solved using parts of the technology outlined in the standard. The paper is a tutorial for junior or graduate engineers to de-mystify the circulating current principle and encourage the use of IEC 61850 and relay logic to solve power system control and protection issues. Hardware selection, scheme design, and network considerations are explored. The paper discusses lessons learned from setting and commissioning in-service solutions. Circulating Current Between Two Transformers. If two or more transformers are connected in Figure 1 – parallel, any difference in the voltage produced by the transformers generates a circulating current. The current is proportional to the voltage difference between the transformers divided by the sum of the impedances around the circulating path. This paper presents a control solution that uses IEC 61850 Generic Object-Oriented Substation Event (GOOSE) messages to create an automatic voltage regulator (AVR) scheme that employs circulating current principles. The paper describes the background of IEC 61850 and some of the solutions GOOSE messaging has enabled. It also explores the requirements for operating transformers in parallel and the need for an adequate control regime. The paper provides a tutorial on the design of a voltage regulating algorithm that uses relay logic. It develops a voltage-based scheme and adds a circulating current biasing technique to allow the parallel operation of up to four power transformers. The paper explores Ethernet networking topologies and the requirements for their successful integration into the substation environment. Finally, the paper shares commissioning requirements and lessons learned from in-service schemes. The IEC 61850 standard was first released in the latter part of the 1990s. It was adapted from earlier work by the Electric Power Research Institute (EPRI) and the Institute of Electrical and Electronics Engineers (IEEE) that defined the Utility Communications Architecture (UCA). 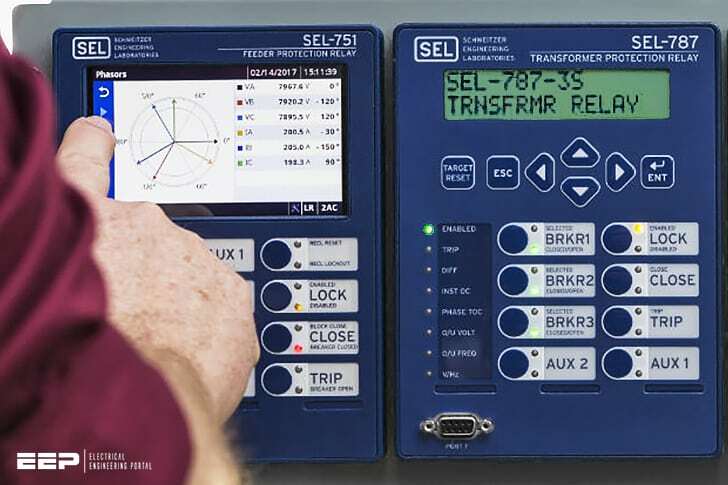 The IEC 61850 standard consists of a set of documents that describe the substation design, configuration, and testing for both client-server and peer-to-peer communications. The standard defines five types of communications services. GOOSE messaging is one of the services defined by the standard and may be the most widely adopted part of the IEC 61850 protocol. Title: Circulating current scheme using IEC 61850 and relay logic for junior or graduate engineers – Brett Hampson; Schweitzer Engineering Laboratories, Inc.